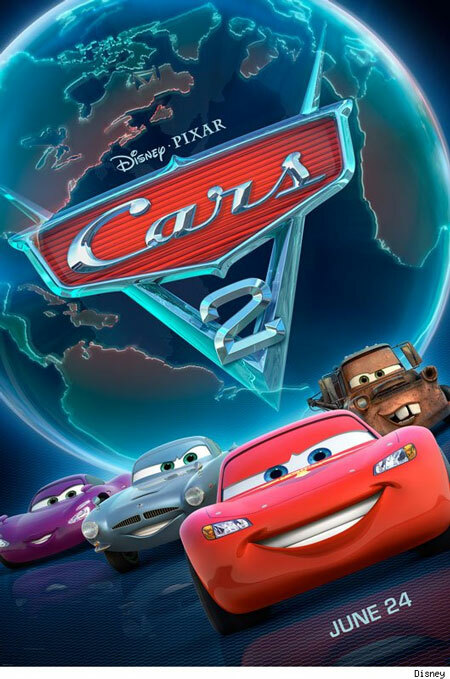 The release of Disney/Pixar’s Cars 2 last month came accompanied by a certain modicum of notoriety. The film, a sequel to the 2006 film Cars, is the 12th feature film produced by Pixar Animation Studios; the latest output from a studio whose name has been near synonymous with “quality.” Over the last sixteen years, Pixar has established the most unenviable dynasty in motion pictures: beginning really with their first feature, 1995’s Toy Story, each Pixar film has succeeded as both a commercial juggernaut and a critical darling, yielding box office earnings often well into the hundreds of millions of dollars (last year’s Toy Story 3 – technically the most successful animated film of all time – topped $1 billion) and such acclaim that the studio has completely dominated the Animated Film category at the Academy Awards for its entire, albeit brief, existence. Of the ten years the Award has existed, Pixar has been nominated eight times – once for every year it was elligible, and was victorious six of those years (and, in my opinion, the loss of Monsters, Inc to Shrek in 2001 was a travesty). Also, though due admmittedly in part to the expanded pool of Best Picture nominees chosen each year, both Up and Toy Story 3 each received the top nomination the last two years; and despite the brouhaha that built between Avatar and Hurt Locker for Best Picture of 2009, that honor, in my opinion, rightfully belonged to Up. The films are additionally remarkable in that their appeal extends far beyond the traditional family audience of animated/Disney fare, having cultivated an “event film” reputation that has extended itself to a decent-sized legion of adult filmgoers. Even to many cineastes and cinema scholars (and especially anti-auteurists), the studio stands as the paragon for collaborative filmmaking; Pixar has always been purported to function as almost a collective, where many voices are allowed to share their opinions and criticisms, with all films being creatively vetted by personnel at all levels of creation and development. Now with the coming of Cars 2, arguments have developed about the current position of Pixar’s once unassailable dynasty. Some, in the face of such elevated expectations, have attempted to write the eulogy for that dynasty; to others, it’s simply one misstep on an ever-developing and growing legacy of films. What (almost) everyone can certainly agree on, though, is this: Cars 2 just wasn’t any good. As someone who has always enthusiastically enjoyed Pixar’s output, I’m personally more inclined to the latter of these two stated positions. It’s exceedingly rare when anything so great can last more than a little while; it’s just a simple fact that amazing accomplishments often do not, and cannot, maintain. It was inevitable that Pixar would stumble eventually, at least aesthetically, if not commercially (though commercially speaking, Cars 2 has proven largely underwhelming, if still profitable). 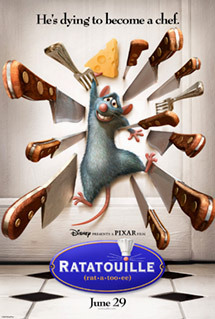 "Ratatouille" was one of Pixar's more outlandish premises, centered on both rodents and haute cuisine, but was still a pretty terrific film. The original Cars itself represented perhaps the previous lowpoint of the Pixar dynasty, which in and of itself is hardly a criticism. 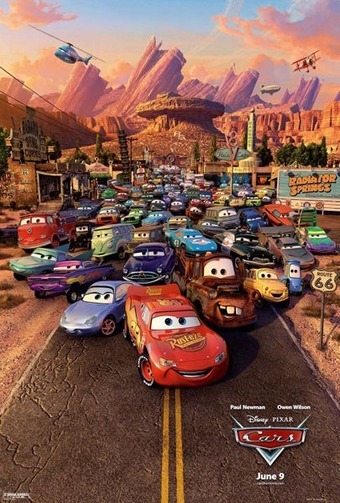 Directed by Pixar Animation co-founder John Lasseter and set in a world where all forms of life are living, talking, anthropomorphic commercial vehicles (and mainly automobiles), Cars told the story of hotshot race car Lightning McQueen, who learns about the value of community, selflessness, friendship, and simply living while he spends a few days stuck in a small town in the middle of nowhere. Like all Pixar films, Cars was extremely well made, exceptionally creative in its detail work, with an impeccable voice cast (including Paul Newman in one of his final roles), and a genuinely sweet story that conveyed its message fairly well. 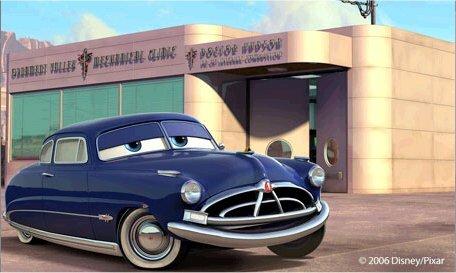 Doc Hudson, voiced by Paul Newman. The blue eyes were a nice touch. It was good, maybe even very good, but it wasn’t great; besides Monsters, Inc, it was the only other Pixar film to lose the Animated Film Oscar in the year it was nominated. It also wasn’t Pixar’s greatest commercial success at the box office, but nor was it the worst. Where it proved extremely successful, however, was in merchandise. With the notable exception of the Toy Story brand, Cars merch remained viable and the brand durable during the five years since the film left theaters. According to the Los Angeles Times just prior to Cars 2‘s theatrical release, revunue from Cars merchandise over the last five years has totalled about $10 billion in revenue, or over twenty times the first film’s overall worldwide box office. The other, very remarkable films I’ve mentioned, such as Up, Wall-E, Ratatouille, or even the far more commercial Incredibles are all superior films by far, but in many cases their profitability did not extend to far past the box office and home media. Two months prior to the release of Up, many alarmist Wall Street analysts actually downgraded Disney’s stock because of their fears about the film’s commercial viability and merchandising potential. They were certainly wrong about the former – the film was a massive success – but merchandise was initially limited to Disney stores and specialty retail outfits. With eyes toward the bottom line, one can see why making a sequel to Cars would seem incredibly practical from the perspective of brand strengthening alone. Just a small sampling of "Cars" merchandise, shown here from a display at the El Capitan Theatre in Hollywood. In and of itself, there’s nothing wrong with that; Pixar’s track record with sequels, as displayed with the excellent Toy Story films, are hardly anything to sneeze at. For all that the panegyrical praise I (and certainly others) have placed upon Pixar Animation here, they are, and have always been, a commercial enterprise. That they have always managed to maintain creative and qualitative standards while doing so is exemplary, but that doesn’t change the fact that Pixar is about producing blockbuster film properties, first and foremost, and now as the property of the Disney Media conglomerate (their former corporate partners who bought them outright in 2006), it answers that master, or monster, above all. It's a safe bet that almost every car shown on this poster for the original "Cars" eventually appeared in toy form. 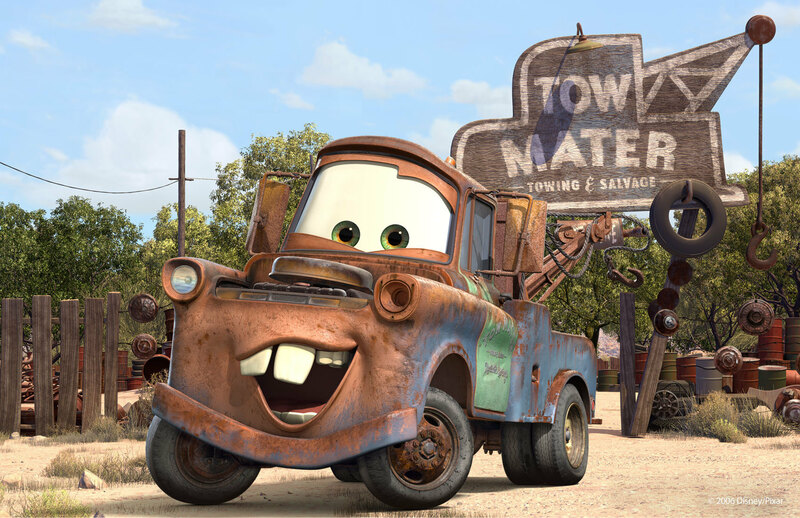 Tow Mater (voiced by Larry the Cable Guy), star of "Cars 2," and arguably its biggest problem. In the film, the incompetent Mater’s borderline uncomfortable boundary issues with Lightning lead to him being confused for an American spy by a pair of British secret agents (Michael Caine and Emily Mortimer), and subsequently drawn into an espionage plot involving alternative fuel sources in a manner that, even by the standards of a film populated by talking cars, feels contrived and threadbare. Overall, the plotline and narrative development felt like a half-hour Saturday morning cartoon (or is it Friday evening nowadays?) stretched to nearly two hours. The characters, who were fairly nuanced in the previous film, are now too simplistic, and their journeys feel especially tiresome and nowhere near compelling enough for the film’s length. Certainly, one of the film’s greatest problems is the focus on Mater. A.O. Scott, in his review of the film, made the exaggerated but astute comparison that the character feels like Pixar’s equivalent of Jar Jar Binks – a crude, pandering, simplistic, and even offensive stereotype, who wears on our patience instead of earning out interest. Unfortunately, though, unlike Jar Jar, Mater is not a supporting role, but the lead, and it doesn’t help that the character’s social faux pas are often squirm-inducingly awkward instead of endearing and empathetic. The appeal of Larry the Cable Guy (real name: Daniel Lawrence Whitney), whose Southern hick caricature embodies Mater (Whitney is actually a Midwesterner from Nebraska), can be called limited. Whitney’s act is basically designed to be an outrageously unfair caricature designed to appeal to a demographic that is often unfairly caricatured; a backwards hayseed designed to be laughed at by “backwards hayseeds.” Other films featuring the character have been box office failures, and one can only wonder what Lasseter and Pixar were thinking spending $200 million on what amounts to a Larry the Cable Guy vehicle. It’s not my intention to sound elitist here; I’m sure there is plenty about the character that, in the right situation, may possibly be amusing, even funny, and Whitney certainly does have his following. But Cars was smart, in retrospect, to surround Mater with other sources of humor so those not really impressed by Whitney’s act could find other things to be amused by. Here however, it’s all-Mater, all the time. Fun fact: this movie actually exists. What feels almost mind-bogglingly stupid about this choice is that Cars 2 has no shortage of amazing comedic voice talent. Besides Wilson, voice actors include Eddie Izzard, Bruce Campbell, John Turturro, and Caine, almost all of whom could be hilarious given the right material but here are provided with few, if any, opportunities to be anything better than occassionally amusing. Caine especially feels wasted; as a movie star, Michael Caine is a creature of two faces – Caine the Actor and Caine the Persona. Caine the Actor is a great, classically trained thespian and one of the most consummate professionals remaining from his generation. Caine the Persona is a self-aware, constantly winking comedy figure with a inimitable cockney dialect, endless charm, and a constant twinkle in his eye. What this movie should have utilized was Caine the Persona. Instead, Caine the Actor has little to do but play things fairly straight and even. The idea, certainly, of Michael Caine giving voice to a spy character lends itself to farcical and satirical potential, but he was consistantly funnier playing superspy Harry Palmer over forty years ago than he is here. Though generally antithetical to the Pixar approach, Cars 2 still illustrates the studio’s strong point – it’s unmatched standard in computer animation. That element here remains peerless and unbelievably detailed; the plot traverses three countries as part of a Worldwide “grand prix” series of races, and Pixar holds back nothing in recreating Tokyo, Rome, and London as reminagined in the Cars universe. Some sequences are even quite breathtaking, including an opening action set piece involving the Caine character on an oil platform. Clearly, the flaws in Cars 2 are not of craftmanship; the work of Lasseter and many different visionary minds with hundreds of clever ideas are on display here, retaining the collective approach that has made Pixar an amazing brand. But in the end, it all serves a mediocre central concept, one that seemed ultimately more designed to be an ungodly expensive toy commercial than a suitably entertaining and engaging motion picture. Right now, it’s too early to tell if Cars 2 will be able to maintain the strength of the Cars brand or if it will be a brand killer; I personally suspect that the end result will lie somewhere in the middle. Certainly, children may even enjoy Mater’s low brow antics enough to want to keep buying Cars themed products for years to come. Hopefully, though, this may mean the end of Cars films; while Cars 2 is on track to do nearly as well as its predecessor, its box office success has been dramatically inflated by increased ticket prices and the premium price placed on 3D screenings. So what does this say about Pixar and its dynasty going forward? It’s hard to say. As flawed as Cars 2 is, one misfire does not make a trend. Given however, that the fiduciary imperitive seems to have superceded all questions of quality here is so atypical of Pixar that one must wonder whether it remains a key concern for the studio. 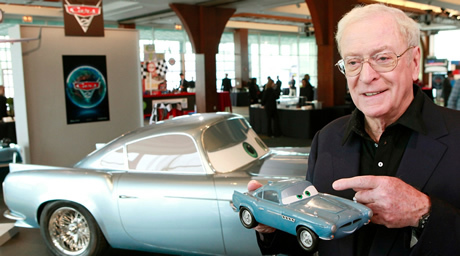 And with the Cars franchise being so much “the baby” of John Lasseter, in many respects, makes one wonder if one voice has come to dominate the direction of the collaborative Pixar Studios too much. 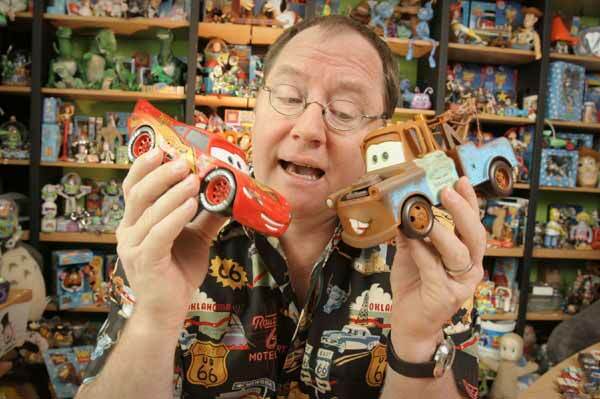 John Lasseter - acclaimed director, co-founder of Pixar, and current head of all Disney animation. Clearly, he has his priorities straight. The hope remains, however, that in the overall scheme of Pixar’s approach, that Cars 2 stands as an anomaly: an obvious merchandise builder that will allow the studio the leeway to continue making films such as Up and Wall-E without concerning its corporate master with worries about stock downgrades. If Pixar’s track record has shown anything, it’s that they are not stupid, and I’m sure the failings of Cars 2 will be something the studio ultimately learns from. One can even make the argument that taking such a misstep can actually be a good thing, as failure can be the mortal enemy of complacency. It’s possible that Cars 2 may force the studio to up its game over the next few years to ensure that such a misfire does not repeat itself. While hardly a perfect comparison, I can’t help but view the Pixar dynasty as similar to that of Alfred Hitchcock. Hitchcock may rightly be called the greatest and perhaps the most important commercial filmmaker of all time, who rarely let his passion for the artistic side of his craft get in the way of its commercial viability. Though while he has an endless list of legendary films, such as Psycho, Notorious, North by Northwest, Vertigo,and Rear Window, he also had his misfires (Torn Curtain, Jamaica Inn, Topaz, and The Trouble with Harry, to name a few). In the end, however, those films did not undermine his amazing canon; if anything, they may have given it more character. 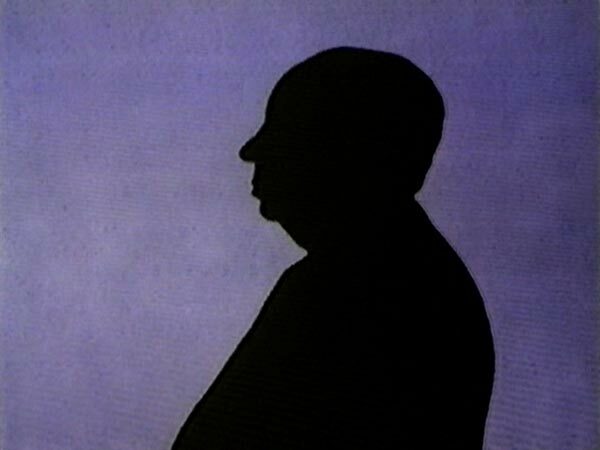 Alfred Hitchcock's legacy casts a long and unforgettable shadow, but not all his movies were at the level of his reputation. So, in the end, Cars 2 should not be seen as the end of the Pixar Dynasty, but the nature of its failure, I feel, should be seen as a crack in the foundation the studio has built upon for the last sixteen years. What matters most is how Pixar Animation responds to it: will they ignore it, sit on their laurels, count their merchandise money, and let the foundation crumble further (which, in many respects, is what happened to Walt Disney Studio’s feature animation division back in the 1960’s all the way through the late 80’s)? Or will they learn from it, reinforce their foundation, and make their dynasty stronger as they carry on into this new millenium? I personally hope the answer to the latter is yes. Because truly, in the end, sometimes true greatness isn’t found within the measure of success, but in the ability to recover from failure. Posted on August 6, 2011, in The Antiscribe Analyzes (Essays). Bookmark the permalink. 2 Comments. Wow. The knowledge that Larry the Cable guy has an EXPANDED role in the sequel just ensured that I will never pay to see Cars 2. It’ll be cable or netflix, if at all. You make a lot of great points here, and I agree that one misfire (I hesitate to call it a flop) does not break a studio. Paul Newman aside, I didn’t really care for the first Cars movie anyway – especially considering it’s not much more than a kid-friendly remake of Doc Hollywood re-purposed as a toy commercial (or am I being too harsh? ).